These earplugs come from the Orejon culture of northern Peru. They are round discs of a lightweight wood, each heavily coated in a white pigment. Engraved black shells are set into the center of each plug and depict three concentric circles. Each plug is 4.5” in diameter and 0.75” thick. The Orejon people (nowadays known as the Witotoans and the Bora), have a patrilineal social structure where kinship is traced through the men of a family. The Witotoan peoples primarily practice subsistence agriculture, growing manioc, pineapple, plantains, bananas, yams, papayas, mangos, peanuts, cacao, and other crops that thrive in the tropical South American environment. Ear piercing is a very common form of body adornment popular in cultures all over the world, and the Witotoan people are no exception. For the Witotoan people, ear piercing is a practice restricted to men. Generally, boys get their ears pierced between 10 and 15 years old. A thin awl is used to pierce the ears, and small wooden pins are inserted into the holes. The boy is then responsible for carving the earlobe hole pins (each slightly wider in diameter than the last). These earlobe hole pins are periodically replaced with the next size larger in order to slowly grow the size of the holes. This type of ear piercing and use of earplugs is less common today among the Canela and the Witotoan peoples as it has been increasingly perceived by the non-native population as “ugly” or “subversive.” However, body adornment remains popular in many different cultures all over the world, including our own. This mask is made of a bark cloth bag, which fits over the head of the wearer and is tied at the top. The bag comes to a point, which hangs over the top of the head. From this point of the tie, there are tassels of straw that hang down. The face portion of the mask has an oval disk of hardened tar, from which there are two tar covered pieces of wood protruding. The black tar is decorated with linear and geometric designs in white and yellow pigments. This mask comes from the Yucuna Indians of Columbia. They inhabit the Miriti-Parana and lower Caqueta regions of the Amazon River on lands called resguardos. These lands are similar to reservations in the United States in that they are constitutionally approved by the government. Thanks to these resguardos, the Yucunas have been able to maintain many of their traditional ways and live with their worldview intact. This worldview emphasizes the interconnectedness of the environment with all living things. This interconnectedness is seen in the belief that balance must be maintained between humans, animals, and plants. If too much energy exists in any one of these categories, it would disrupt the natural flow of life. To aid in maintaining the balance, the tribe uses shamans (religious leaders) to help guide the group in properly distributing their resources and keep a healthy balance. The mask depicted here is used in tribal dances by men. The mask is most likely used to celebrate the harvest of palm fruit, but it is only used once before being discarded. The dance is a way the Yucuna can celebrate their interconnectedness with nature and keeps nature in balance. Palm fruits come in a wide variety and are found in tropical regions all over the world. Some examples of the edible varieties of these fruits are coconuts and Acai berries. For many indigenous peoples around the world, palm fruits provide essential food for survival and even today are seen as an important part of their lives. Like the fruit, there are other parts of the palm tree, which provide for people. Leaves can be used as parts of traditional clothing and for housing, and they can also be used to store food by wrapping it up in the leaves. The bark and trunks of some palm trees are used for bark cloth clothing, such as what was used in this mask, in addition to making canoes. 2012 Jagua, A Journey into Body Art from the Amazon. Los Angeles: Kouraj Press. This object is a head flattener made by the Shipibo Indians of Peru. It consists of a long narrow cotton pad attached to a wooden board which is then attached by strings to another square cloth pad. It would have been used to elongate the shape of an infant’s head. The practice of head flattening, also known as cranial deformation, has a long and interesting history in cultures all around the world. It is thought to be the oldest form of body modification, dating back at least 9,000 years. While cranial deformation can occur naturally or accidentally after birth, many cultures choose to deliberately shape an infant’s head, generally because it is a sign of beauty or status. Head flattening, which has not been proven to cause any damage to the brain, has occurred on every continent in the world at some point in time. Pressure is applied to a baby’s skull during their first several weeks of life when the bones of the skull have not yet fused together. It is accomplished by using a cradleboard or a special binding board such as the one in the Ethnology Collection. This process gradually shifts the bones of the skull, forming an elongated shape. The bones then fuse together in that shape. Papua New Guinea, Africa, Central America, and Australia are only a few places where cranial deformation has occurred. North American tribes, including the Chinookan people of the Columbia River area in Oregon and Washington, used cradleboards to produce a wedge-shaped head in a child. This practice died out by the 1950’s, but it illustrates the prevalence of this practice. Even ancient Egyptian, Roman, and Greek nobles practiced head binding as a statement of beauty. In the Andean areas of Peru, cranial deformation was a common practice for both women and men between AD 1200 and 1450 (before the time of European contact with Central and South America). The head flattener from the Ethnology Collection possibly derives from this fascinating tradition. This fine mesh maguey fiber bag from Colombia is decorated with 6 brown bands, each approximately 1/2″ wide. The undecorated carrying strap allows for the bag to be worn over a shoulder. The Kogi (also known as the Kagaba) Indians who created this bag live in the Sierra Nevada de Santa Marta region at the northern tip of Colombia, in the mountains bordering the Caribbean Sea. The Sierra Nevada boasts a wide variety of ecosystems, allowing for the Kogi to be largely self-sufficient. The Kogi primarily practice slash-and-burn agriculture and raise domesticated animals such as oxen, pigs, and sheep. Bags such as this one are used to carry everything from food to children, and they are usually woven from the maguey (also known as agave) plant. The strong, durable Maquey fibers are used across Central and South America by many indigenous cultures, including the Maya, for nets, bags, clothes, hammocks, and many other useful items. The Kogi, descendents of the Tairona civilization, see themselves as the “Elder Brothers” of humanity. 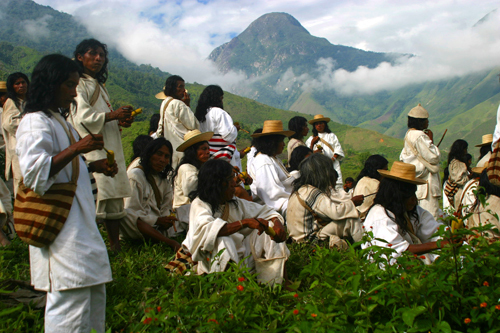 Anyone not living in the Sierra Nevada de Santa Marta, which they consider to be the heart of the world, is considered a “Younger Brother.” The Kogi believe that it is their responsibility to protect nature against the ecological damage wrought by modern society and “Younger Brother.” Maintaining a balance in nature is vital to the survival of the world, according to the Kogi. Up until 1990, Kogi priests, called Mammas, worked hard to maintain a policy of isolation from the rest of the world in order to protect their cultural ideals. In the past 20 years, however, this policy has been undermined by a variety of factors including encroachment by large-scale banana plantations, marijuana and cocaine manufacturers, and paramilitary revolutionary forces. Today, the Kogi struggle to maintain their traditional way of life while also engaging in a wide-scale South American indigenous resurgence movement. This feather ornament is described in the Ethnology catalog as a “tail” that is meant to be attached to the back of a man’s robe, called a manchakintsi or cushma. The donor that collected with particular “tail” also donated the cushma it was meant to go with, E/1956/2/11, shown on the right. These objects were made by a member of the Machiguenga tribe of Peru. The Machiguenga are a part of the Arawakan linguistic family, a group of languages spoken throughout South and Central America. The Machiguenga live in the upper mountain rain forest of Southeastern Peru. The Machiguenga grow manioc, bananas, maize, sweet potatoes, peanuts and a variety of other crops in small agricultural plots cleared out of the forest. They supplement their diet by hunting, fishing and gathering other native foods from the forest. Feather ornaments, especially crowns and necklaces are popular amongst the Machiguenga.